Most business don’t make it through their first year , let alone 25. For Upper Deck to still be going strong 25 years after the company released the first trading card product is a testament to how much collectors enjoy Upper Deck products. With fans being so critical to the success of the company, Upper Deck issued a challenge to fans with a $2500 shopping spree at the Upper Deck online store up for grabs. 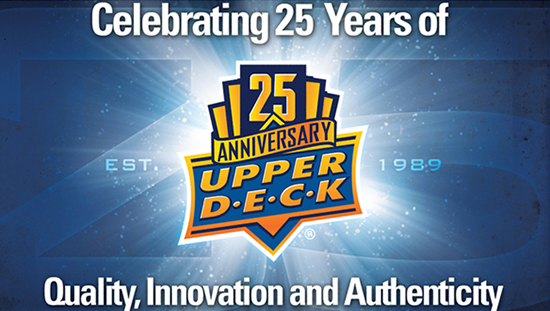 The challenge was to make a fun video congratulating Upper Deck on the company’s anniversary while incorporating Upper Deck products into the video. Ultimately the winner did something a little out of the ordinary. He brought the Upper Deck logo to life and took it on a cruise to celebrate the anniversary, take a look! And recently we shared another video where fans, celebrities and industry insiders wished UD a happy anniversary while sharing some of their favorite moments from the last 25 years, check it out!